The Ouse Valley Eagles 2018 Player of the Year Awards take place tonight at the Slug and Lettuce, Milton Keynes. Players Player of the Year – Gareth Pullen and Darren Gregory. The Eagles kick off the 2018 season at home to the Sussex Thunder on Sunday afternoon at Bedford International Athletics Stadium. After going 10-0 in the regular season last year the Thunder unexpectedly went down 26-9 against the Berkshire Renegades last weekend, and head into the game eager to get back to winning ways. The Eagles meanwhile come into the 2018 campaign following back-to-back 4-6 seasons, looking to rebuild again with a small but highly committed squad of players keen to cause a few surprises along the way. The game kicks off at 1pm, with free admission for all. Head Coach Neale McMaster will be missing LB/TE Darren Willison due to a back injury. WR Troy Mayer has a thumb injury and will be a game-time decision, but QB Martin Day is back making his first start since 2015 following a serious knee injury. “We’re excited to finally get back to playing football after a long preseason. If you can’t make it to Bedford to watch the games, we will be providing score updates via our Twitter and Facebook pages. The Eagles’ 2018 regular season schedule has been confirmed, and sees the team kicking off at home in SFC1 Central to last season’s division champions Sussex Thunder on Sunday 22nd April. That is followed three weeks later with the return game on the South Coast, before a first ever meeting with the Berkshire Renegades the following week. After a week of practice we then have games on four successive weeks vs Bristol Apache (H), Berkshire Renegades (H), Oxford Saints (A) and Solent Thrashers (H). There then follows back-to-back games in July against the Thrashers (A) and Saints (H), before the regular season comes to a close on 12th August with a trip west to face Bristol Apache. All home games will take place at Bedford International Athletics Stadium and kick-off at 1pm. All away games will kick-off at 2.30pm unless otherwise stated. As per the 2017 season eight teams in Division 1 will progress to the play-offs, consisting of the top two teams in each of the four conferences (NFC1 North, NFC1 South, SFC1 Central and SFC1 East). The first round of the play-offs will see the #1 seed in the SFC/NFC face and #4 seed, and the #2 seed meet the #3 ranked team. The Division 1 Championship will be decided between the NFC1 and SFC1 winners. The Ouse Valley Eagles were formed in 2013 with the aim of becoming one of the leading lights for American Football in the UK. Despite being a relatively new Club, the Eagles are made up of an experienced team of coaching and backroom staff, with more players registering to join each month. The goal set by our founding committee was to have a club here still winning games in 25 years time, and for our children to be able to play for the same team we did. Which team are you interested in? Do you have any previous playing experience? We will not pass your details to third parties. You may opt out of receiving these communications at any time by emailing gdpr@oveagles.com or using the opt-out facility on each email. The club are looking for coaches to work with each of our four teams ahead of the 2018 season. The Eagles were formed in 2013 following a merger between the Milton Keynes Pathfinders and Bedfordshire Blue Raiders, initially as a Senior contact team offering football to those in Bedfordshire, Buckinghamshire and Northamptonshire. The Bedford Blackhawks Flag team were created in 2016, and were soon joined by the Blackhawks Youth (now U17) kitted 5v5 team. Last month we launched our Player Development Programme, which focuses on strength and conditioning, diet and nutrition, football education and skills measurement. We also recently announced the formation of a second U17 contact team – the Milton Keynes Redwings – who will initially play friendly matches during a development year in 2018, with a view of joining the National League in 2019. The ideal candidates will hold a Level 1 BAFCA Coaching Qualification in American Football and have previous coaching experience, or be willing to obtain the qualification at the earliest opportunity. They will be available for practice sessions and games, highly organised, able to communicate effectively, have a forward-thinking approach to American Football, a positive attitude and a passion for developing talent. Player retention, recruitment and development is a central part of our coach’s role. As such you will be expected to work alongside our existing coaches in order to facilitate the transition of Academy players into the senior program, and from flag to contact football (and vice versa) as appropriate, demonstrating and promoting the values of the Club at all levels. To register your interest in coaching with our club, please complete the form below. All correspondence will be treated in confidence. Which team are you interested in coaching? Do you hold a formal American Football coaching qualification? Do you have any previous coaching experience? The 2017 Annual General Meeting will take place at 11am on Sunday 10th December at the University of Bedfordshire’s Bedford Campus. All club members, coaches, committee, friends, family and supporters are welcome to attend the AGM. This includes all teams under the Ouse Valley Football banner: Ouse Valley Eagles Senior, Bedford Blackhawks Flag, Bedford Blackhawks Youth, Milton Keynes Redwings Youth. We’ll try and keep things short, and focus on giving you a chance to ask questions rather than listen to us talk at you. We’ll cover elections to the committee for the year ahead (see below) as well as a brief financial update, a review of 2017 and then look ahead to the upcoming year. All registered players, coaches, committee members and staff over the age of 18 will be eligible to vote. While we’d love to see former and prospective club members, players, coaches etc. on the day, only those registered for the 2017 season will be eligible to vote. What if I cant go – can I still vote? If you can’t make the meeting, you can ask someone to be your proxy. This means that you can ask someone to vote on your behalf, but you have to let us know in advance. We are currently reviewing our constitution to make sure it’s in good shape. There will be some minor amendments required to support the positions detailed below, and we’ll discuss those on the day. If you would like to request an item be raised or discussed at the AGM please let us know at least seven days in advance, i.e. by 11am on Sunday 3rd December. As per the Club Constitution, all persons intending to stand must give notification of their intent prior to the AGM by completing the form below. All nominations also have to be proposed by two team members – one of whom must be an existing Committee member. All roles involve a significant amount of commitment. Prospective Committee members will need to to attend regular meetings via Google Hangouts, attend team events, own the delivery of specific pieces of work and have the time available carry out any tasks required. There are a number of alternative ways to help the team without being on the Committee. We will be posting details of some particular vacancies we have shortly, so if you’d like to get involved in other ways, please watch this space! The Ouse Valley Eagles and Bedford Blackhawks 2017 Player of the Year Awards took place last night at Revolution Milton Keynes. For the Bedford Blackhawks Youth team Fin Jones was named MVP, Oliver Chester Lewis the Coaches Player of the Year and Sam Butterwick the Players Player. Harrison Reed and Connor Perrett won the Offensive and Defensive MVP awards respectively, Alex Gedny picked up the award for Offensive Rookie of the Year and Rom Dougla was named Defensive Rookie of the year. Oliver Crampton won the Most Improved Player award, and the first recipient of the Dhesi Award – presented to the player who best promoted the spirit of the sport and named in memory of former MK Pathfinders, Peterborough Saxons and Northampton Nemesis player Jay Dhesi – went to Harrison Smith. For the Blackhawks Flag team Matthew Couldridge was named MVP, Jake Cooper Offensive MVP, Jed Parisi the Defensive MVP and Zech Smith picked up an award for Exceptional Contribution. Kase Chibwe and Stu Holland were the big winners for the Eagles. Chibwe was named Team MVP and Players Player of the Year, and Holland won the Offensive and Special Teams MVP awards as well as Lineman of the Year. Mike Turner is the Defensive MVP, Ryan Bowtell the Most Improved Player and Stuart Cooper won the inaugural Coaches Award. 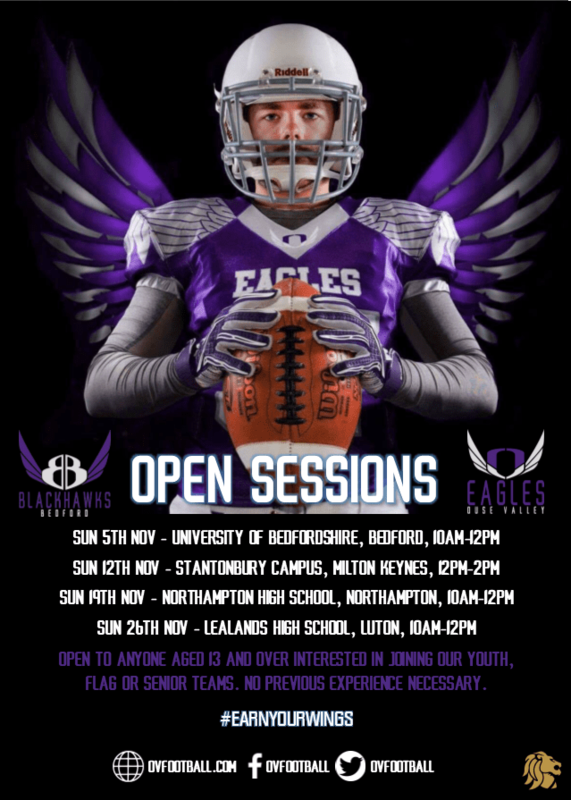 The Eagles and Blackhawks are running a series of Open Sessions throughout November in Bedford, Milton Keynes, Luton and Northampton, aimed at anyone interested in playing for the club during the 2018 season. Click here for more information. The Ouse Valley Eagles 2017 Player of the Year Awards take place tonight at Revolution Milton Keynes. The club are very pleased to be able to confirm the details of this autumn’s Open Sessions ahead of the 2018 season. American Football is one of the fastest growing sports in the country, and with the success of the NFL International Series interest in the game has never been higher. If you have always fancied having a go why not try it out and see how you get on? No previous experience is necessary, as our team of qualified coaches will put you through your paces running a series of passing, catching, running and blocking drills designed to give you a real taste of American Football. The Eagles were formed in 2013 with the aim of becoming one of the leading lights for American Football in the UK. We are the only senior full contact team playing in the BAFA National League in Beds, Bucks and Northants, recently announced a partnership with the Bedfordshire Bulls, and with plans to grow the club further in the coming months there really has never been a better time to join! To register your interest in our Open Sessions please complete the form below, get in touch via Twitter or keep your eye out for the events on our Facebook page. The club are delighted to announce a partnership with the Bedfordshire Bulls. 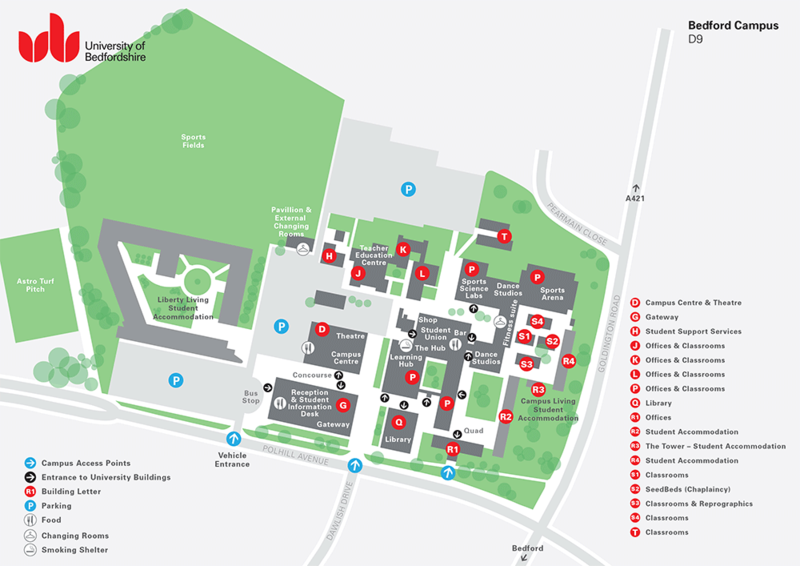 With a number of campuses across the area and more than 24,000 enrolled students, the University of Bedfordshire is a modern, innovative university with a heritage of top quality education. As part of the agreement our teams will enjoy use of the University’s grass and artificial pitches at the Bedford campus as well as classroom facilities, and Eagles coaches will work with the Bulls as they embark on their first BUCS Division 2 Midlands Conference campaign. “We are incredibly excited to be teaming up with the Bulls and hope it is the start of a long-term partnership between the programmes. “I will be trying a sport for the first time, like so many of the University of Bedfordshire students. It’s a proud moment to be facilitating the opportunity to try something new, as that’s what its all about. “I hope that this model of partnership between student groups, local organisations and passionate individuals can be replicated to other areas of the sporting landscape within the Bedfordshire Bulls, as we look to develop our sporting programme in an organic and sustainable way. Open Sessions for players interested in joining the Eagles for the 2018 season will be taking place during November. Further details will be announced shortly, but to register your interest in the meantime please get in touch via Facebook.com/ovfootball or Twitter.com/ovfootball. Taster Sessions for University of Bedfordshire students interested in joining the Bulls will be taking place over Freshers Week at the end of September. Further details can be found via BedsSU.co.uk/sport or Twitter.com/BedsBullsAmFoot. The Eagles Senior team are looking for a number of new coaches to join Head Coach Neale McMaster’s backroom staff for the 2018 season in the following positions. Coach McMaster is looking for new QB, WR, DL and LB coaches to work with his existing team of coaches to develop our players and each other, as the team looks to build on last season’s 4-6 record in BAFANL Southern Football Conference 1. The successful candidates will be qualified to BAFCA Level 1 (or be willing to obtain that qualification almost immediately), and will have previous coaching experience. If you are interested in one of these positions please contact Coach McMaster via neale.mcmaster@oveagles.com. Copyright © 2019 Ouse Valley Football. All rights reserved. Design by ThemeGrill. Powered by WordPress.